Now I hadn’t been having much luck with my GPX4500 and the 14” Elite, matter of fact no luck at all since I’ve owned it which is only about 6 months. This morning I had found a small patch of four little nuggets with my SDC and I thought after lunch Bruce and I will come back and I’ll give the GPX and the Elite one more crack and if no luck machine and coil will never see the light of day again. Earlier in the morning we had found and old reef with workings so this afternoon we decided to detect about 15 metres down from the top. It was getting towards late afternoon and Bruce was about 30 metres from me working the slope and I was happily going about my business poking the coil in and around bushes, moving logs etc. when I felt this pain in my stomach erupt and nature was calling real quick. For me it seems as though every time I go out and start detecting within the hour nature calls, it’s something I really hate. Anyway I downed tools unzip the backpack and grabbed a roll of toilet paper and my pick and made my way over out of the way of Bruce. 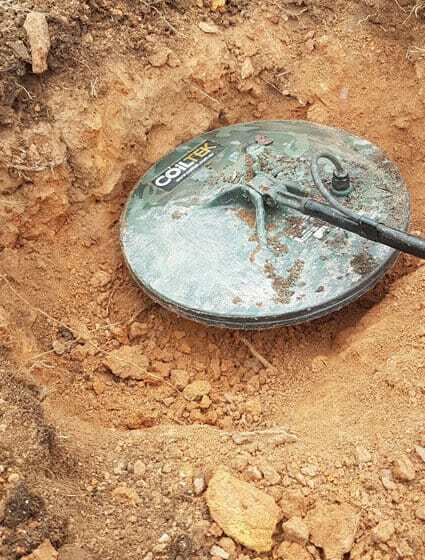 Found myself a nice tree dug a hole did the business and walked back to the detector. After putting all the gear back on I had realised I left my pick behind so instead of unloading everything again I walked over to where I was and found the pick. As I bent down to retrieve it the detector let of a nice warble, I looked over my shoulder and gave the coil bit more of a wiggle and it warbled again. This caught my eye as I knew it was a target, but the target was within inches of where I had done my business 5 minutes ago. I just stood there looking at it and wondering should I dig it up or just leave it as it could be lead shot for all I knew, or it could be gold. I think I stood looking at this mound of over turned soil for a good 2 minutes before I started walking away to where I was detecting before. I got about 10 metres and thought, what if it is gold. Anyway it got the better of and I went back, waved the coil over the target and it was still there. I gently scratched around the pile hoping not to disturb the contents and I waved the coil again. The signal still there so I dug a little deeper avoiding the poo that was beside it. I gave the coil another wave and it was getting louder. I tried to pin point where it was and you guessed it, smack in the middle of good old number two. Well I come this far and wasn’t about to back out now, I threw the pick forward of the pile and punched it deep into the soil to get as much top soil and other matter in one hit and dragged the picked towards me while unearthing toilet paper and waste with it. Now I don’t have the strongest stomach at the best of times and I gave a little dry reach while this mass of paper and soil tumbled towards my feet. The stench got to me and I had to pull away to get a breath. Holding my breath I quickly threw soil on top to stop the smell from escaping. Next I had to check for the target and hoping that is was still buried…please let it be buried and not below my feet. I picked up the GPX and slowly waved the Elite over the hole and heard the target. I let out a big sigh, grabbed the pick and started digging again. After about 30 minutes I was down about 9” and the target was there, I couldn’t see it but the way the machine was screaming it must be close. I gave the hole once last scrap and next wave of the coil told me the target was out. I pinpointed where it was and thought I’m going to savour this moment so I’ll use my hand to grab the soil and find the target. I got lucky as the first handful I waved across the coil told me I had it in my hands and I was rewarded with a grey looking piece of lead. A second look and a spit of saliva proved me wrong; it was a nice looking nugget. My first ever piece with my GPX4500 with the 14” Elite and I was wrapped. I had heard so much about this coil as it’s the only coil in my arsenal because the previous owner got rid of the rest and said this is the only coil you’ll need. After washing it in water and taking a couple of photos and carefully filling in my hole I decided to take it over and show Bruce what I found. . I explained the whole story to him that night around the fire while having a couple drinks and we both had a good laugh.